Ateliê397 (www.atelie397.com) is an independent space dedicated to the dissemination of actions, works and thoughts in the field of contemporary art. Headquartered in the city of São Paulo, Brazil, the space has established itself as one of the most important spaces in the Brazilian art circuit, hosting exhibitions, video shows, performances, debates, and courses. Thinking of all of its actions as potentially critical interventions is of particular interest to the space. We understand that independent management is built in a collective way, through the creation of networks. For this reason, about three years ago we began a process to internationalize our activities, including in our programming the participation of guests from outside Brazil, including space managers, artists, curators, and researchers. The “get2gether” project is the first international curator-in-residence program offered by Ateliê397. We are looking for curators who are interested in the current production of Latin American art (especially Brazilian art) and who take up a collaborative stance to begin a dialogue and mutual exchange. 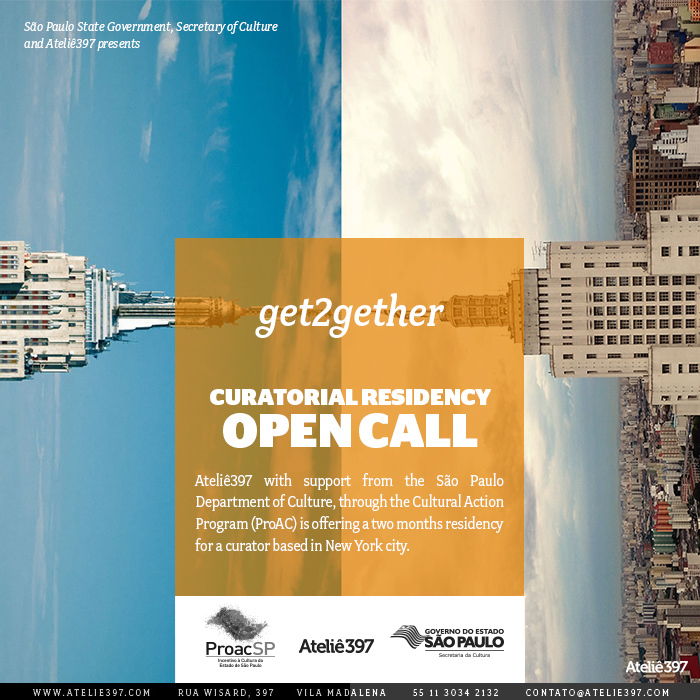 Ateliê397’s “get2gether” project is a residency program for a curator based in New York City. With a duration of two months, the program is aimed at curators who are interested in participating in the activities of an independent space and learning more about São Paulo’s contemporary art scene. The selected curator is expected to get involved in the activities of Ateliê397, thinking together with us about the actions, communication, management model and our relationship with the art circuit. The purpose is that the program will encourage a dialogue between both cultures, aiming at possible future exchanges between the two cities. This will be a two-month program running from January 20 to March 20, 2017. The program offers the curator-in-residence transportation (a round-trip airfare –NY/SP/NY), accommodation and a cost allowance in the amount of six thousand reais (R$6,000). The curator is expected to use Ateliê397’s facilities as his or her workplace, and an attendance of at least eight hours/week at the space is required. At the end of the registration period, the documents received will be reviewed by a jury composed of artists and curators. The curator selected for the program will be responsible for arranging for and obtaining the visa.